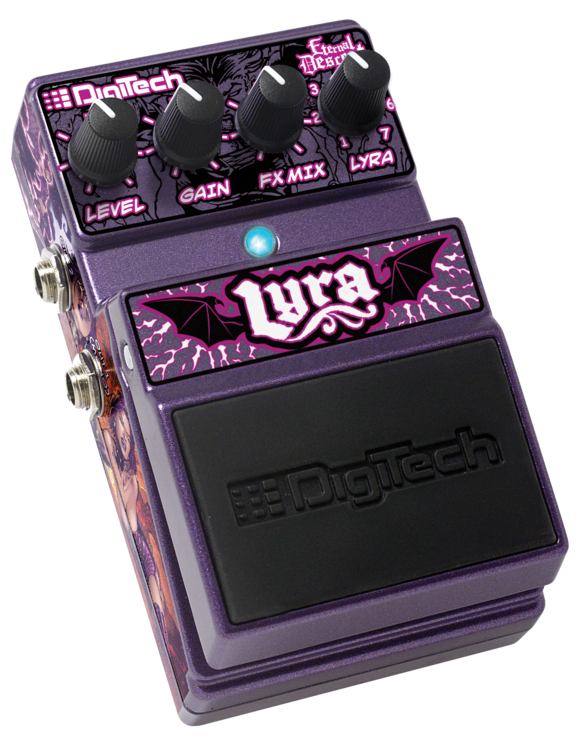 The DigiTech® Lyra pedal is a limited-edition stompbox featuring 7 tones created for the music associated with the characters in the Eternal Descent comic book/CD created by Guitarist/Comic Book designer Llexi Leon. The music for the series features some of your favorite guitar heroes including Atreyu, Firewind, Shadows Fall, Static X and others! Working closely with Llexi Leon and Eddie Kramer, Senior Production Modeling Consultant (and world-class recording engineer), the DigiTech team designed Lyra's set of 7 meticulously-crafted tones utilizing the same gear used on the original Eternal Descent recordings. 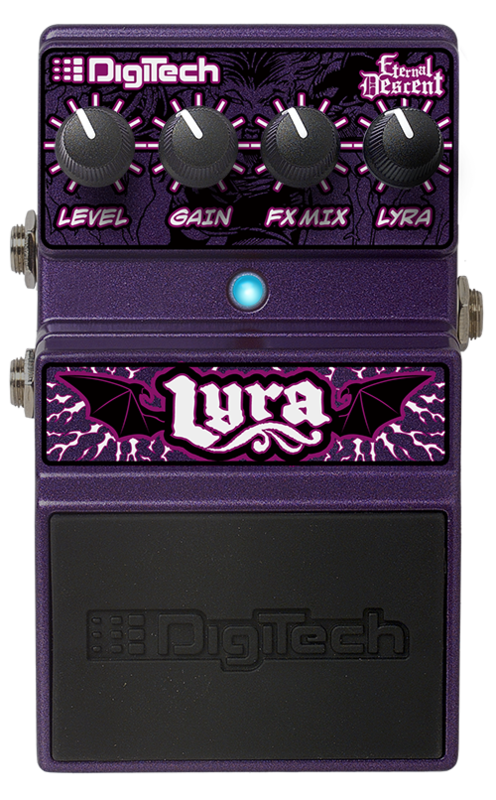 The sounds in the Lyra are custom designed tones programmed into 7 Lyra (song) types. There are Level, Gain, and FX Mix knobs for added control over each of the sounds. Harman PS200R DC power adapter included. "Crystal Cascade" - A shimmering clean tone laden with repeats. "Memories flooding back, moments lost in time, echo in eternity." "The Morass" - An eerie tone with a touch of dirt and a swirling phase. "Distant melodies come bubbling from the black mire." "Ethereal Entity" - A saturated lead tone with a slow attack and reverse delay. "The voices of the damned are calling." "Divine Lead" - A soaring rock lead with an octave effect. "An aria of the angels"
"Lyra's Lightning" - A super-charged lead tone with delay. "Lyra's signature shred attack." "Dark Blues" - A smooth tweed tone with a plate reverb. "On tour with Constellation 9"
"Crushing Chaos" - A nightmare of heavy gain and extreme phase shifting. "Machinations of a madman."